At breakfast this morning, I remembered snippets of a dream, which I related to Tim immediately. From my house, I walk outside. There is a bit of ivylike ground coverage (the dream has provided this—it doesn’t exist in the current reality). Over by that ground coverage, I see many cardinals, all male, all bright red. There must be thirty of them. Some are flapping and hovering low to the ground, just above the ivy; others are already on the ground. They are all having at something. I get closer, and I see that it is a white cat. The white cat is quite dead. It’s possible, I think, that these cardinals haven’t killed it but are simply scavengers. But I know I’m kidding myself. And I worry about how I’m going to break the news to my neighbor. I am wearing an almost-black rubber wristband that says DESPAIR. I am wearing it for a week. A couple of Christmases ago, Sewa Yoleme sent me this wristband as part of a satirical trio that also included the very-black NIHILISM and the very-light-gray APATHY. I wore APATHY once, but then I realized that I had cared enough to put it on, which muddled me rather. Now that I have left my beloved Northbrook for what is likely the last time, I am wearing DESPAIR for a week. That’s the plan. In keeping with our ongoing denial, we signed up for two weeks again next year, one in June and one in August, on the off chance that the place doesn’t sell and the owner opens it as a B&B. But it feels like a long shot. And, as I’ve said to others and possibly written somewhere, the uncertainty is beginning to feel like a long breakup. Is this the last time? Is this? Is it more painful to just stop, or is it OK to squeeze as much out of it as you possibly can if you’re really in love? That spot on earth—and I mean that very spot—has felt like some sort of emotional home to me from the second I first set foot on it more than twenty years ago. It’s partly mine. But not mine in a way that has any legal standing. Maybe I should start thinking of it as the place where my grandfather Trespassers W used to live. The place he used to live that I can’t physically visit. I really believe I’m going to see my Northbrook buddies again. We seem to have bonded. Something else will come along that I will love. Something different. Now I’ll have time to do things I haven’t done because I wouldn’t not go to Northbrook. I cried a lot when I left. But I cry a lot every time I leave there. Maybe I can trick myself into thinking that this time’s no different—that nothing can keep us apart. I am not a full-time nurturer. I am not someone who adds living things to my household that demand a lot of attention: children, pets, plants. I am someone who lives in Vermont with neither garden nor dog. An anomaly. But a few years ago, for Christmas, Marguerite—the mother of Sewa Yoleme—sent me a plant. 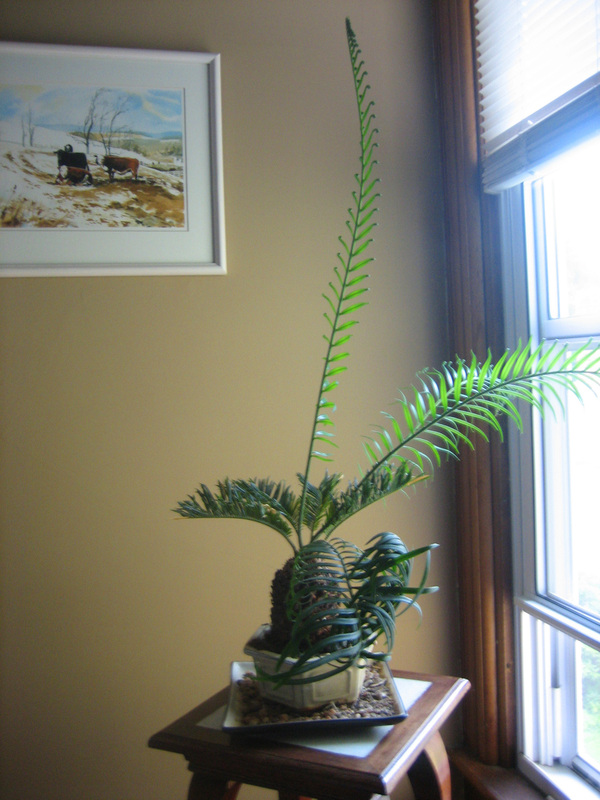 A sago palm. Beautiful little thing: four leaves sprouting out of the top of a shaggy little trunk. Fits on a plant stand. Looks fabulous with my décor, such as it is, and brings a little of the tropics into my home—specifically, into the corner of my bedroom. Let me repeat: I have a plant. I have had it for several years. It is still alive. Last year it sprouted a new leaf. The leaves are the type made up of a bunch of their own leaves—you know, like ferns. (Bear with me. This is not a language I speak.) This leaf didn’t look like the original four. It was bigger, and the texture was different. Tim at one point turned the plant away from the sun, and the leaf contorted, twisted back on itself. It stayed that way, like that face your mother told you not to make. Right after I got back from Portland last month, the plant sprouted three new leaves. These mothers are huge. One sticks straight up, twenty-six inches so far, which, given the height of the plant stand, puts the top of its head almost dead even to mine. Apparently sago palms and pets don’t mix. Wikipedia reports that the plant is toxic to humans and animals, but pets seem to find it yummy. At least half of them who snack on a sago die. You have been warned. Am I going to actually have to replant this thing? It’s in such a pretty, bonsai-sized planter. They look so good together. Time will tell. I don’t want to piss it off. Per requests. Twisty leaf coming straight at you.